Saoradh said it had been contacted by a number of concerned parents of children taking part in the event in Derry’s Guildhall “with the facilitation of British Crown Forces”. “Pro-establishment parties and those within the Catholic Church would have us believe that Crown Forces are a normal part of our community,” Saoradh said. The sinister involvement of British Army and RUC/PSNI in the activities of schoolchildren has long been a contentious issue across the North. Local Saoradh representative, Paddy Gallagher, said children were being constantly harassed, intimidated, stopped and searched and even having their homes raided by British forces. After the youth club agreed to not take part in the planned event, Sinn Fein said the ‘forced cancellation’ was ‘entirely unacceptable’. “It is disgraceful that a youth organisation seeking to provide a positive platform to young people should be forced to cancel it due to the actions of Saoradh,” they said. 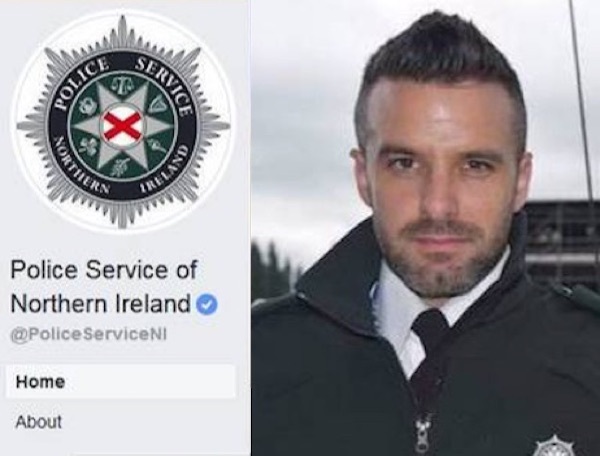 Saoradh said it was taking legal action after a string of defamatory posts by an anonymous PSNI Sergeant were directed at the organisation and their Newry representative Stephen Murney on Facebook. Mr Murney’s legal representative, Darragh Mackin, from Phoenix Law stated, “It isn’t, and can never be, acceptable for the PSNI to use social media as a tool to attack and defame individuals and their political beliefs.